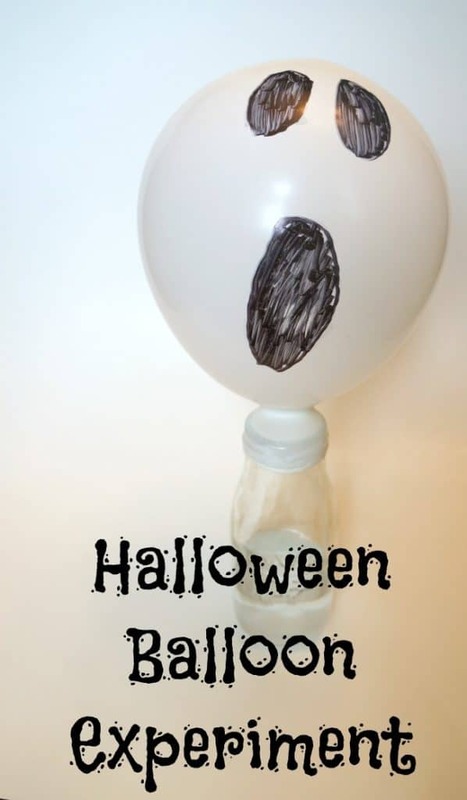 Get your kids in the mood for Halloween with this fun and easy ghost balloon Halloween experiment. My 2-year-old was wowed by this one, we did it a few times with different balloons. Thanks to Bitz and Giggles for the original idea. You probably already have everything you need to do this at home. Bottle – I used a glass milk bottle but you can also do this with a plastic water bottle. Baking Soda – 1 Tbsp. 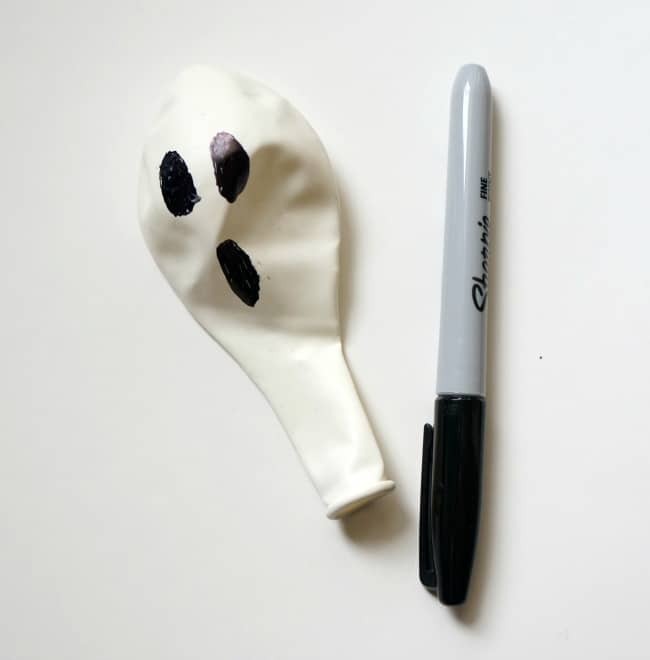 Draw a fun character on the balloon, you can do a ghost like this or maybe a pumpkin on an orange balloon. 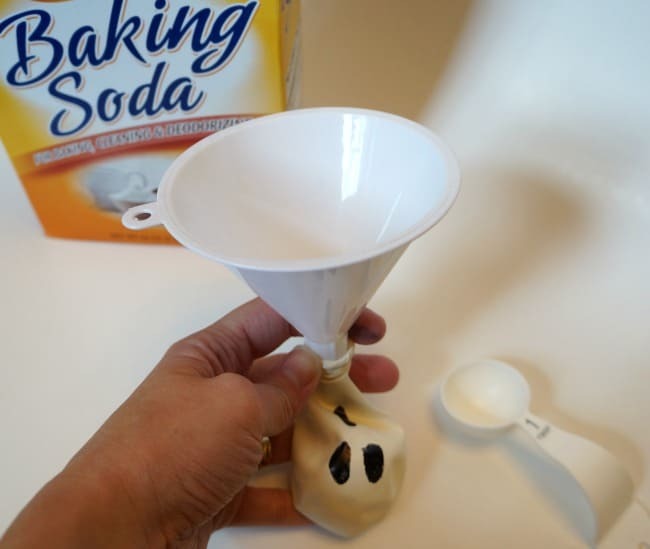 Next, use the funnel to add 1 Tbsp baking soda to the balloon. Then fill the bottle with 1/2 cup vinegar. Stretch the balloon around the neck of the bottle being careful not to mix the baking soda and vinegar just yet. Gently shake the contents of the balloon into the bottle and an eruption will happen, causing the balloon to inflate! 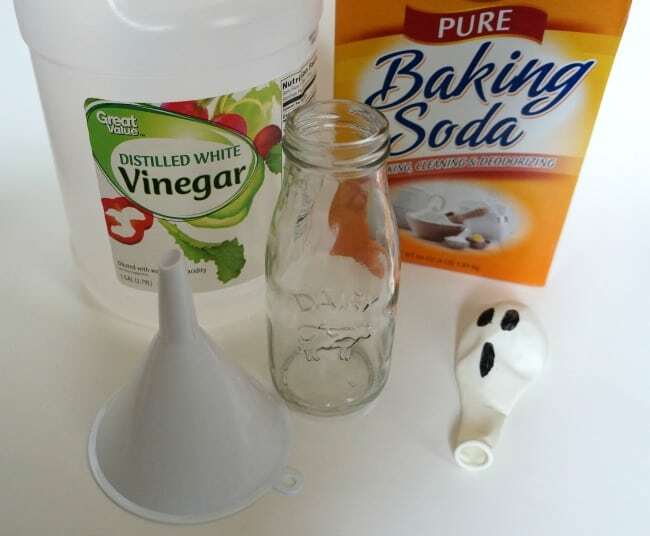 When baking soda and vinegar are combined they produce carbon dioxide gas which fills up the balloon. Be careful not to add too much of either ingredient or the balloon could pop off the jar and make a big mess. 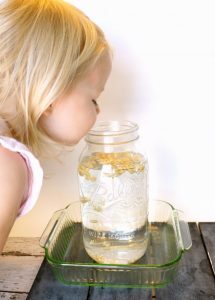 These types of simple experiments are fun to do with kids any time of year. For older children, let them hypothesize what they think might happen when the 2 ingredients mix. For younger ones, let them watch and be in awe. Check out more kids science experiments below.